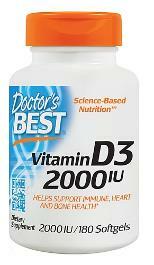 Vitamin D-3 is an especially useful supplement for those who do not get a lot of sun exposure. It is a fat-soluble vitamin that is necessary for maintaining strong, healthy teeth and bones. Many vitamin D supplements use ergocalciferol or vitamin D-2, but Vitabase Vitamin D uses cholecalciferol (D-3), a more bioactive form. This is the same form of vitamin D made by the skin’s exposure to sunlight. Vitamin D Deficiency Syndrome (VDDS) is what researchers have termed the lack of vitamin D. VDDS has the potential to result in serious health problems. For many years a chief source of vitamin D has been milk fortified with this vitamin. Recent reports, however, indicate that fewer Americans, including children, are drinking milk. Osteoporosis, a significant problem, particularly among postmenopausal women, results as calcium is depleted from the body. Calcium supplements alone cannot reverse the problem, but they must be combined with vitamin D for proper absorption. Taking vitamin D and calcium may reverse osteoporosis or prevent it, if it is taken consistently before menopause. In studies, regular use of vitamin D significantly reduced age-related fractures in those over age 65. Suggested use: As a dietary supplement, take one(1) tablet daily.